From tabletops to tablets, Microsoft is continuing its journey on evolving what "Surface" computing means. With the introduction of the Surface Hub at its Windows 10 event, Surface has entered its third form factor as a digital whiteboard that serves as the center of your group communications. The 84-inch 4K display is the center of the collaboration and sharing experience of Surface Hub. For participants not physically present for the meeting, Surface Hub relies on Skype for Business to connect video calls using the built-in cameras, microphones, WiFi connectivity, and speakers on the device. Microsoft says that it takes an average of 12 minutes to get a meeting started, and Surface Hub's simplicity is designed to make business meetings in the boardroom or the huddle room more efficient. With a single tap, business users can connect to a Skype call and share meeting notes with virtual attendees. In a demo, Microsoft shows that when you pick up the pen, the digital whiteboard launches on the 84-inch screen. You can interact with the whiteboard with multitouch gestures, the digital pen, and apps can even run with fluid graphics so you can demo a 3D rendering, bringing rich data to brainstorming sessions. Notes are captured automatically on the whiteboard with OneNote for the large screen. With Surface Hub, meeting participants no longer need to take a photo or screenshot of the whiteboard as the presentation content will automatically be shared at the conclusion of the conference. 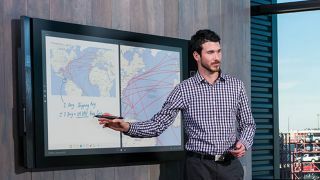 As Surface Hub is centered around brainstorming and the meeting experience, users can connect their devices to Surface Hub to share content via wired or wireless connections. With Surface Hub, Microsoft is targeting existing teleconference solutions such as those made by Polycom and Cisco. The Skype for Business service also competes with Google's Hangouts.